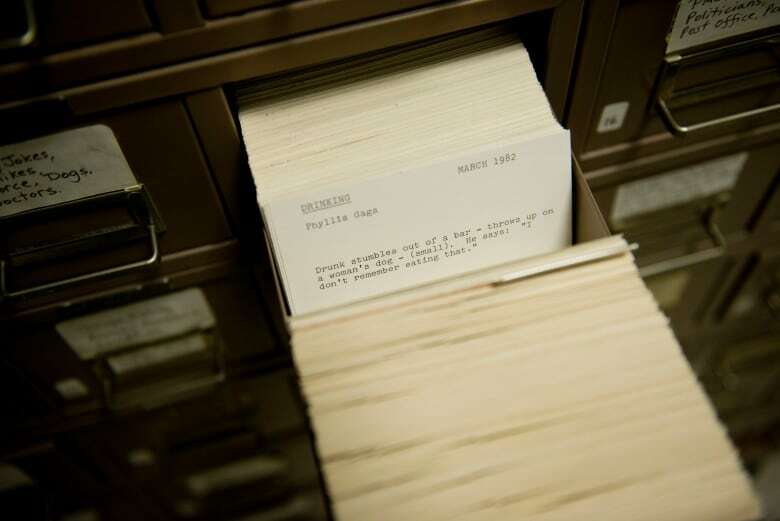 Before she died, pioneering female comedian Phyllis Diller donated her entire collection of jokes to the Smithsonian — a steel filing cabinet full of 52,000 meticulously annotated, fully indexed gags. Now, the Smithsonian is asking volunteers to help transcribe them so they can be digitally archived for all time. We hear from three volunteers, the former intern who had to scan the cards and the Project Coordinator. It didn't matter if you didn't laugh at Phyllis Diller's jokes. Her laugh was big enough to fill the room. "It's my real laugh, I can't help it," she told NPR in 2006. Born in Lima, Ohio in 1917, Diller was a trained pianist, a housewife and mother, and a copywriter for radio before she ever set foot on stage. She launched her club act at the age of 37. There were no other women doing stand-up. By the time she died in 2012, she'd been a household name for half a century, and women in comedy lined up to recognize her influence. Ellen DeGeneres, Ruth Buzzi, Joan Rivers and Rita Rudner paid their respects. "She was an inspiration to all comediennes, absolutely," said Rita Rudner. Diller's act depended on an endless supply of gags. "Someone clocked me one night at 800 one-liners," Diller told NPR. "It means you've got a good memory, and you have to hook them all together so it sounds like an act. It mustn't sound like you're reading them out of the book." Diller's one-liners didn't come out of a book. She kept her jokes in a steel cabinet on tens of thousands of index cards, categorized by subject and filed into 48 drawers. 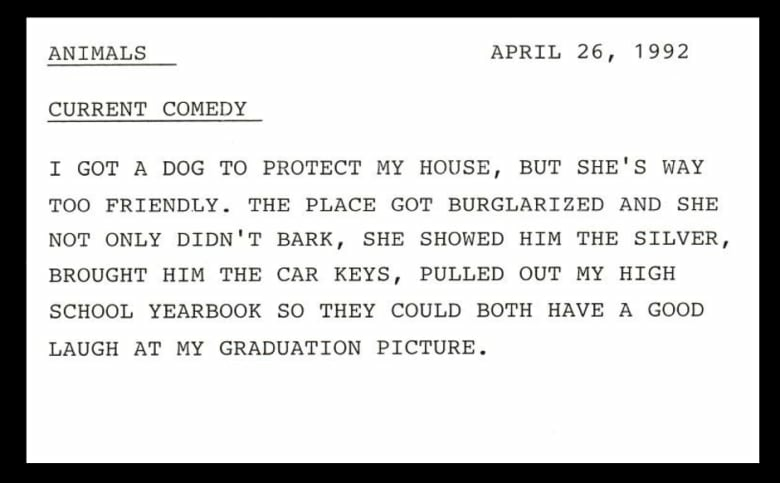 In 2003, Diller donated her joke archive to the Smithsonian. "The cards are arranged by category. It was a way in which Phyllis Diller was able to organize her jokes or her material and quickly reference and pull together material for acts," Meghan Ferriter at the Smithsonian Transcription Center told me on CBC Day6. The Transcription Center is enlisting volunteers to enter all of Diller's gags into a digital database. As data entry jobs go, this one is not typical. One transcriber notes her previous task was rendering the Burpee Seed Essay Contest. The Diller job is way more fun, and workers are sharing the gags that make them laugh using the hashtag #DillerFile. The volunteers work online from scanned images of the 52,569 cards that have been uploaded to the Smithsonian site. Each of those scans was created by Hanna BredenbeckCorp, a Project Assistant who works with Ferriter at the Smithsonian Transcription Center. She didn't know much about Diller before handling the joke collection that made her famous. "Before I started this, I pretty much knew she was a comedian and that was about it. I read her autobiography once I learned that this is what my project was going to be. 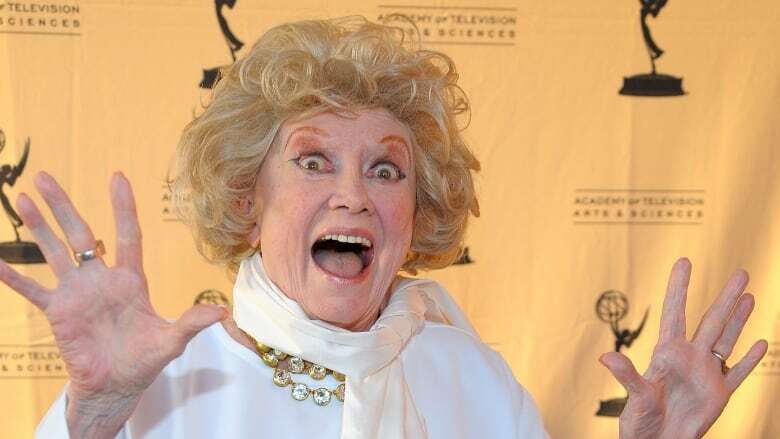 And that's really where I learned the most about Phyllis Diller and her amazing career." And what was the title of that book? "Like a Lampshade in a Whorehouse — My Life in Comedy." BredenbeckCorp explains the material in the file drawers is not consistent. Jokes are not solely preserved on index cards with a type-written one liner. Some are two sided, some have attachments, like comic strips or note pages which are stapled to the cards. In other cases, cards had been paper clipped together. Handling them was a serious archival exercise. I wondered if she learned as much from reading the jokes as she did from Diller's autobiography. "It sort of tells a different story," BredenbeckCorp says. "Her autobiography sort of talked a lot about her background growing up, the family she was raised in, in addition to the different parts of her career. She was a painter. She was a classical pianist. And so she did a lot of other things besides comedy." Carefully removing the cards and material from the drawers put the tools of Diller's trade in BredenbeckCorp's hands. She held the raw material of her act. Could she hear Diller's voice as she read the gags? "Her delivery is what makes her jokes," BredenbeckCorp says. "And so when you read them on paper, it's not quite the whole story: her sort of persona, her voice, her laugh — that's what really makes a joke. And so you sort of have to envision the whole thing when you're reading the joke." Transcribing <a href="https://twitter.com/hashtag/DillerFile?src=hash">#DillerFile</a> for <a href="https://twitter.com/TranscribeSI">@TranscribeSI</a>. Saw joke "Airport bar: Rock of Ages." Took 5 min to guess punchline "let me hide myself in thee"
On my honeymoon I put on a peekaboo blouse. My husband peeked and booed. Diller's style was self-deprecating. She made jokes about her appearance, about a (fictional) sexless marriage, about her miserable cooking (which in real life was actually very good.) She knew she was playing a character and it made her wealthy, but it doesn't mean the jokes she gave to the Smithsonian still work today. I asked Meghan Ferriter if any of the volunteers are cringing at the subject matter. "Well, there actually are a number of jokes that really represent the historical context and cultural values and other forms of social relationships at the time. Some of our volunteers have surfaced them, and really have the opportunity to engage with, kind of critically reflecting on why that was acceptable humour at the time, why that made people amused." "On the whole, our volunteers are finding that there's a lot more lighthearted humour and especially one liners." And the material is certainly not scaring them away. Usually a transcription project of this scale takes three to four months to complete. The Diller files have attracted 630 new volunteers to the project, meaning the gags should be transcribed in about five to six weeks. I asked Hanna BredenbeckCorp to tell me a joke that stands out from one of the 52,569 cards she scanned. "When God was handing out chins, I thought He said gins. So I said 'Make mine a double.'" And if that didn't make you laugh, try listening to this.